Have the New Year celebrations softened the bite of the Dragons? Or has it filled them with a refreshed determination to make the Den experience extra miserable for those who visit? After tonight’s episode, I’d say it’s somewhere in between. With two deals made, there’s still some Christmas spirit lingering. But the claws have been sharpened and they’re not afraid to use them. The first entrepreneur out of the lift in 2016 was Caner Veli. He brought with him with his clothing protector spray that made everything liquid-proof. I've been guilty of dribbling my dinner and drinks down myself on many occasions, so this seemed right up my alley. 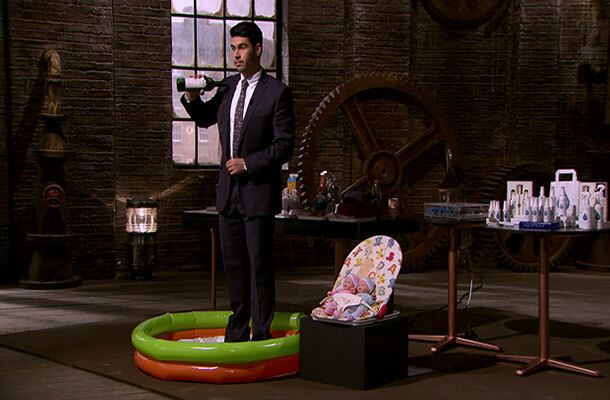 Caner was in the Den searching for a £100k investment from the Dragons for 5% equity in the brand, called Liquiproof. Following his spectacular pitch, he was given no time to breath as the questioning turned straight to his IP. What patent do you have for this? This was the question that was on all our minds. Luckily Touker Suleyman came straight out with it. If Caner owned the patent for the liquid-proof formula, taking the product to market could be a lucrative business. He could exploit the product for all its worth, safe in the knowledge that the technology would be his alone for the life of his patent. That’s an exciting thought. Unfortunately, the excitement stopped there. More digging showed that Caner was just selling someone else’s patented product under his own brand. His exclusive licensing agreement was just a self-written distribution agreement worth little more than a soggy piece of paper. This caused unease among the investors as they questioned the valuation he’d made on the business. Intellectual Property (IP) is a valuable asset and could add a hefty sum to your balance sheet if valued correctly. The Dragons agreed that, as Caner doesn’t own his most important business assets (the patent or the licensing deal), there was little value in the brand. There’s 2 fatal errors you’ve made here. One is the contract. But secondly your valuation is off the scale…that agreement is the thing that will place the value on your business. One by one, the Dragons backed out of the deal until just Touker remained. Despite the concerns raised, he saw potential in the brand and made a significant offer. With his experience and influence in the fashion world, his aims to take the product to the masses came with two conditions. His lawyers would draw up new agreements with the patent owner to secure Liquiproof's future, plus they would become equal partners. All for the £100k Caner desperately wanted. If you’re considering applying for a patent or entering into an IP agreement, you should always seek legal advice. How you manage your IP could determine how successful your business can become. As Caner’s Den experience proved, unless you have the right paperwork and protection in place, you could hit stormy waters before you set sail. Patent and IP attorneys are experts in their field. They know how to put together applications and contracts to get you the right protection for your innovation. After such a grilling in the Den, the surprise offer was too good to be true. Caner shook on the deal, leaving with 50% of his business resting in Touker’s hands. If Caner’s Den visit has inspired you to take a look at the IP your business owns, you should take a look at our IP for Business toolkit. It contains everything you need to start understanding, protecting and utilising your IP. It includes free online tools to help you identify your IP assets, as well as guidance on IP advisors and non-disclosure agreements. Where do you source your information when writing this blog? You've just repeated what a dragon said without looking at the facts. Did Levi Roots own the patent to reggea sauce? IP is not just about patents. You know this. I agree the contract had a small error regarding parties involved but the agreement still stands. This blog post should focus on that Touker understood the value of a mans word. I would suggest you contact the relevant parties involved so you can showcase the correct information. As viewers, we can only comment on what we see on the show. Our purpose is to highlight potential IP challenges or issues that businesses may face and provide information and guidance that can help them avoid encountering future problems. We're pleased you secured investment with Touker and wish you all the best. I've just watched your program and I couldn't believe my eyes and ears how the dragons got to see this or how this product got passed your producers? Surely the millionaires ( dragons ) had heard of Scothgard fabric protector tm. From 3M suppliers and manufacturers. My company which was Scotchcare services was set up 35yrs ago and to see this on your program, well I couldn't believe he thought he would get away with it. Ideas and belief are great but if you don't have the business knowledge and funding they go by the wayside. Thank you for your comment. The IPO isn't involved in the production of Dragons' Den so unfortunately we are not able to comment on the entrepreneurs and business ideas chosen to pitch in the show. But I hope you enjoy reading our blog.